Color Capture & Identifier - Android App Review. This app has the very useful function of detecting and identifying colors using the smartphone's camera. All you need to do is aim and click and all the information you need is immediately displayed, ready to use. But why do you need this app? Well, our reviewers found out the uses are many and varied. Of course, if you're a professional or even amateur artist, this app lets you use any color you see, from the color of a red, ripe apple to the faded color of old, worn out concrete. Even for photo editing, this app will let you use the colors you find and like right in your creations. And last but definately not least, our reviewers with kids found this app invaluable, letting the children point and click at colors and then produce paintings and works of art with those colors. Interior decorators and people having a house makeover will not be able to put this app down. But, does the app deliver all that it promises to? The app is simple to activate. Just run it, aim at the object whose color took your fancy, make sure the target reticle is exactly centered and presto, the color is yours. Color Capture & Identifier displays a host of info about any color identified, including it's recognized name (for all you people out there redecorating) and it's RGB, CMYK and a host of other color coding protocols. Another great feature Color Capture & Identifier has is favorite color bookmarks. Are you a home decorator or interior designer who wants to know if the tiles that just got in are the color you ordered it? No problem, just point and click. Do you have your favorite color palette painstakingly gathered over time to use in your art or photo editing? Just use the bookmarked colors. All our reviewers found the app real easy to use, with simple screens and menus that combine that oh so elusive feature of displaying the right amount of info in a screen that is at the same time easy to use and does not confuse or frighten users away (you know how squeamish some of those artists can be ..). So, what are the app's disadvantages? Actually, we didn't really found anything wrong with it.This app is very stable and does exactly what it says it does, displaying information in a very simple and easy to use way. Our conclusion is the Color Capture & Identifier is a very solid app, has a lot of useful features from the favorite color bookmarks to the info and finding the closest named color that matches the one shown. We liked it! Score: 5.0. Very easy to use, simple and shows exactly what we want to know. 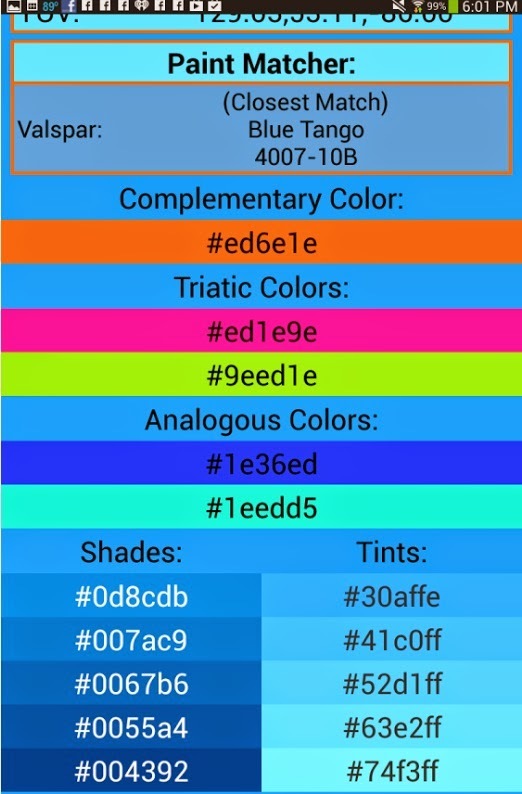 Description: A color identification and naming app. 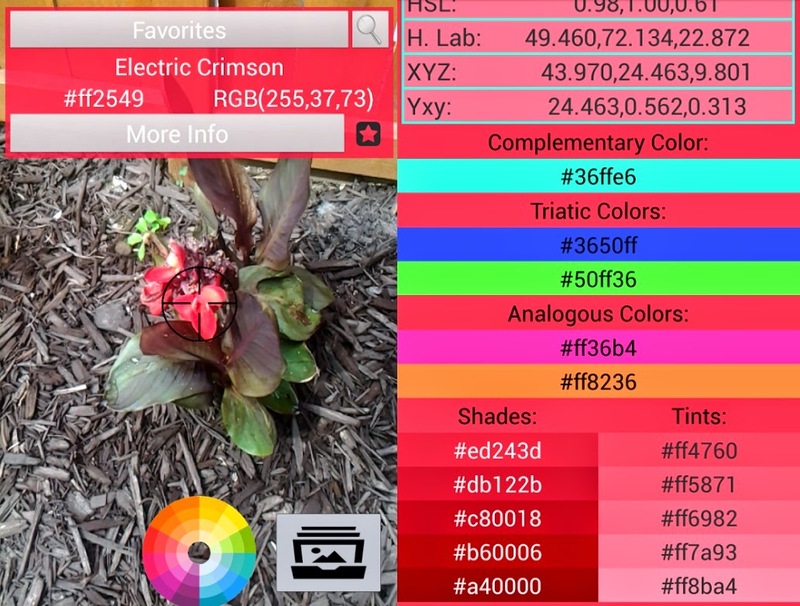 This app can identify a color through the camera, give us all the info about it and even give us the named color closest to it. Good Points: Easy to use and master. Named color. Favorite color bookmarks. A lot of color information. Experience: Our reviewers liked it because it's very easy to use. Just install, run it, aim the camera and click away to get the color info you want. Longevity: All our reviewers who needed color info, from parents to interior decorators to artists are definitely going to keep this app installed. Even those who aren't professional artist found it useful because they do photo editing and the like.